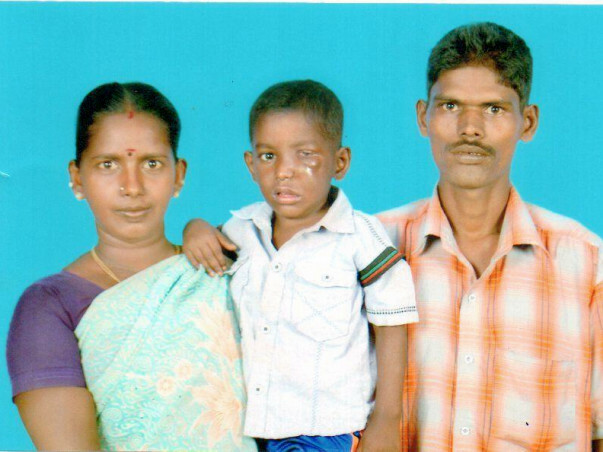 Six year old Rajkumar is a son of daily wage labourers Subramanian and Vijaya in Namakkal District of Tamilnadu. Rajkumar has two sisters aged 10 and 12. In 2015 a small lump appeared near his nose and subsequently he was diagnosed with cancer. Since they were not able to afford to treat him in a private hospital, they took him to the government hospital in Coimbatore. 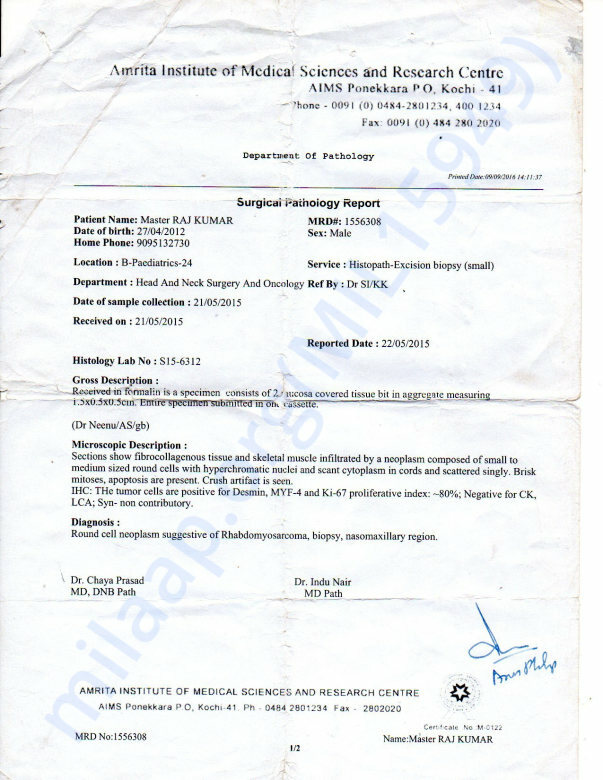 But the doctors considering the child's condition, referred him to the government hospital in Chennai. They continued his treatment in Chennai Govt. hospital. And the treating doctors in chennai informed the parents that they have done everything possible. But unable to see their son suffering every day the parents were determined to continue his treatment. Unfortunately Rajkumar's father Subramanian expired six months ago. Rajkumar's uncle Palanisamy who is also a daily wage labourer took him to Amrita Institute of Medical Science and Research Center in Kochi. Every visit to Amrita hospital, Kochi costs them Rs 10000 and they are visiting once in a month as they could not afford to stay in the hospital for the treatment. His mother Vijaya and his uncle Palanisamy have exhausted all the sources of money for his treatment. Rajkumar could not afford to visit the hospital for his treatment for the past one month. 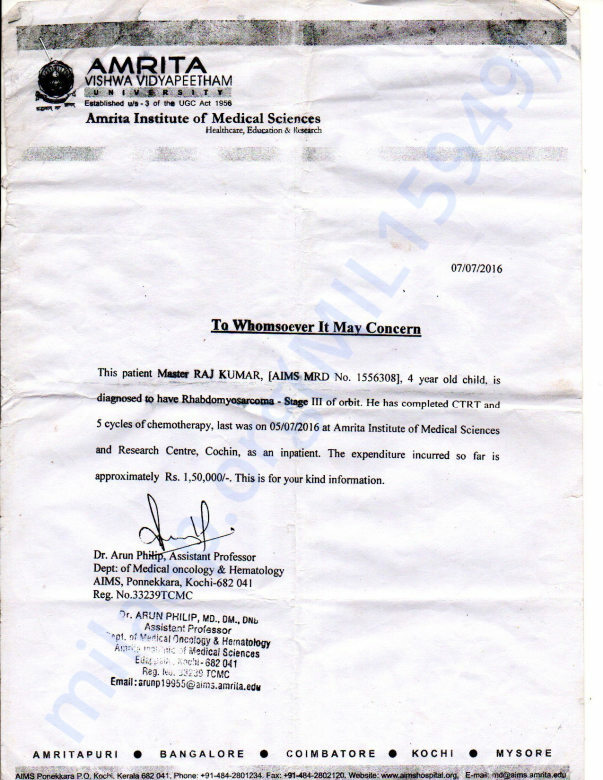 They have already spent nearly Rs 200000 and to continue his treatment they need urgent help.